State government is foremost to blame for failing to keep lead from poisoning Flint’s water supply. And key decisions to switch the city’s water supply to the Flint River, and stay there ‒ despite mounting public complaints about the taste, odor, color and health effects of the city’s tap water ‒ were made by a succession of state-appointed emergency managers. Those were the conclusions of a five-member task force assigned to investigate the public health emergency in this poor, predominantly African-American city. Its report, released Wednesday, called for a review of the state’s emergency manager system, which the task force contends played a significant role in the government’s sluggish response to the concerns and warnings of Flint residents. The 116-page report offered a rebuke to a signature tool of Gov. Rick Snyder and a legislature that has largely supported the emergency manager law. The law, resurrected by Republican lawmakers in 2012 weeks after state residents voted to drop it, was hailed in some quarters after its implementation in Detroit led to that city’s swift transition through bankruptcy. But the law has also been the subject of lawsuits as well as accusations that it disenfranchises minorities, who note that most of the cities and school districts placed under emergency management have been majority black. Snyder said Wednesday he was open to adopting many of the recommendations made by a task force that he appointed, adding that his office has already begun implementing some of the suggestions. “There are a lot of excellent recommendations here,” Snyder said at a news conference. In Flint, the task force found, the emergency managers appointed by Snyder failed to consider, much less serve, the health interests of residents, a criticism the governor himself seemed to acknowledge in testimony last week before a congressional committee investigating the Flint crisis. In essence, Wednesday’s report said, Flint’s emergency managers were too narrowly focused on the financial savings of switching the city’s water from the Detroit Water and Sewerage Department to the Flint River in 2014, and too reluctant to switch back to Detroit, also for financial reasons. As a result, the voices of local leaders and residents were marginalized. The report pointedly cited the economic and racial demographics of those residents. The task force recommended Lansing review the emergency manager law with an eye toward restoring “checks and balances” on decisions made by emergency managers. Such managers also should be given greater access to experts in areas like public health, and should ensure that local residents and officials have a voice in how policy is shaped, including the ability to appeal emergency manager decisions, the task force recommended. If legislators adopt the recommended changes, it will be a welcome relief to Kary Moss, executive director of the American Civil Liberties Union of Michigan. Last summer, Curt Guyette, an investigative reporter for the ACLU, broke the stories about the high lead levels in the water and the ACLU has called for changes in the emergency manager laws that had, at one point, covered cities and school districts in which more than half of the state’s African-American population lived. Many of the recommendations suggested by the task force were outlined in a 2014 Bridge Magazine article examining why emergency manager laws are more popular in some states than in others. The article noted that while Michigan’s law, which gives broad authority to emergency managers, was mired in controversy, other states such as North Carolina and Rhode Island avoided acrimony by enacting laws that were more proactive and encouraged more input from local leaders. Experts told Bridge that Michigan should pay more attention to monitoring financially distressed cities before they are in crisis and, if intervention is needed, give local leaders a more meaningful role in the recovery. “The reason why some (receiverships) succeed and others don’t, I believe is if you don’t have buy-in it’ll never get through it,” James Spiotto, a municipal bankruptcy expert and co-author of “Municipalities in Distress? : How States and Investors Deal with Local Government Financial Emergencies,” told Bridge at the time. Much of Wednesday’s task-force report focused on other government failures, most notably by the much-maligned Michigan Department of Environmental Quality, which failed to enforce drinking water regulations, and the Michigan Department of Health and Human Services, which failed to act promptly amid mounting evidence of elevated lead levels among Flint’s children. The governor, meanwhile, had the “ultimate accountability” for the emergency managers he assigned to Flint, the report said. Likewise, it was Snyder who appointed the heads of the state environmental, health and treasury agencies, which bore “differing degrees of responsibility” for Flint’s health crisis. Without mentioning Snyder by name, the task force derided his insistence that the Flint debacle was a local, state and federal failure of government. Such a statement “implies that blame is attributable equally to all three levels of government. Primary responsibility for the water contamination in Flint lies with MDEQ,” the report concluded, while Flint was under the control of state-appointed emergency managers. Anna Heaton, deputy press secretary to Snyder, supplied Bridge with a listing of all the task force recommendations via email that details how the governor’s office is handling them. It is implementing some, considering others and referring the remainder. Michigan has had an emergency manager law since 1988, though it was strengthened in 2011 before state voters dumped the law in 2012. The legislature enacted the current law just weeks after the state referendum. Dozens of states have emergency managers in response to an outgrowth of failing municipal and school district finance. “All constituents of cities are constituents of the state,” said Mark Funkhouser, the former mayor of Kansas City, Mo., and publisher of Governing magazine, who says such laws can be useful in proper circumstances. He estimates that of 1,000 cities in the country with more than 40,000 people, nearly a third are in financial trouble. Emergency managers have helped cities like New York, the District of Columbia and Detroit, he said. The Flint water task force would argue that, at least in Flint, it did not. The report found that emergency managers – Flint had four separate ones between 2011 and 2015 – made several questionable decisions, including the now disastrous call to use the Flint River and then, amid mounting calls to return to water from the Detroit water system, blocking the switch back to Detroit. In the latter case, Emergency Manager Jerry Ambrose rejected a largely symbolic 7-1 vote in March 2015 by the Flint City Council which urged a return to the Detroit system after months of complaints by residents. In blocking that option, Ambrose said the cash-strapped city could not afford it. It was an example, said Kolb of the task force, of how local residents and officials had lost their voice and the ability to influence local decisions. Emergency managers alone decided to use the Flint River for drinking water, and stay with that decision even after mounting complaints by residents. State treasury officials, through the terms of a 2015 loan to Flint, told the city it could not return to the Detroit system without prior state approval. Emergency managers, often experts in financial matters, often do not have expertise in other aspects of effective government. “They don’t know anything about public health,” according to Kolb. Kolb said that without public input, residents and other local public officials didn’t have the chance to raise meaningful questions about the move to the Flint River. Perhaps, he said, someone would have asked about corrosion control, the absence of which allowed lead to leach from the inside of city pipes and into the water entering residents’ homes. The MDEQ should have required corrosion control, the report found. “All those opportunities were missed because you had a few people making decisions,” Kolb said. State Sen. Phil Pavlov, R-St. Clair Township, was sponsor of the existing emergency manager law. He did not return a call Wednesday seeking comment. Snyder created the task force in October 2015, the same month he approved the switch back to the Detroit water system. Flint had been using the river’s water since April 2014, a move which brought immediate outcries. But it wasn’t until July 2015 that most residents learned about the potential lead problem. Still, it was three more months before state officials acknowledged lead was in the water and that a return to Detroit water was warranted. Emergency manager laws have been around since the Roman Empire, but few, if any, were as "broad" as Michigan's PA 436. Even the Romans left the Senate in place for day to day governing decisions while the EM conducted his business (usually the defense of Rome). By usurping EVERYTHING PA 436 turned local elected officials (and those that reported to them) into wall decorations. Add to that mix the underemployed accountants that flocked to the states' seminars about how to become a six figure EM, and you get Flint, DPS and a host of other isolated (even the state government didn't do much to help them) EMs governing education and cities - nothing they had any real world experience doing or knew much about. Take away the arguable success of the Detroit experience which had a lot of good faith help from everyone, including the unions, and the landscape of success is pretty barren. It also, to me, illustrates the difference in decision making between a CEO and a CFO. Balance sheets and bottom lines are not the whole enterprise. Here PA 436 put in place a bunch of CFOs and that is the result you get when you are in charge and can't see or ignore the broader picture. Overuse of the "broad" emergency manager law in Michigan has had just about the consequence you could expect. I am open to the idea of repealing the EM law in its entirety or voting to recall the Governor. Perhaps both. One thing is certain, if that law is still in place in any form come this November, guess which way I will vote. The problems outweigh the benefits. We did repeal the law. But someone signed it back into law again. Now we can't vote it our by a vote of the people. He and the republicans made sure of that when they voted it back in. It is not a good law and illegal. Let the voters decide if we want the Emergency Manager Law repealed.............oh, wait we already did say Get Rid Of It, but our esteemed leaders in Lansing didn't like the idea of the Citizens having a say, so they passed a NEW law, added a chicken feed appropriation to the bill, and in one fell swoop they cut their EMPLOYERS out of the discussion. These are the same folks who want a say in what goes on in our bedrooms, as part of their push to "get the government out of our lives". EM laws have rightly been used/supported by both democrat and republican governors. No matter who you vote for, once in office, that practical reality will set in for the next governor--as it did with Governor Granholm back in the day. I believe the issue at hand is improving the EM law so that you actually have a leadership structure that understands all the various aspects of providing local government services. The EM's have been bean counters with financial management experience. Clearly, someone with city administration experience ought to be part of any EM leadership team in the future. Repeal the law and let the next city veering toward bankruptcy drive off the cliff? Sure, that's better. Trying to create some equivalency between the EM law that Governor Blanchard, Engler and Granholm all used with the draconian and discriminatory law that Gov Snyder and the current iteration of the Republican legislature forced on the state over the voters objections is dishonest. The problems created by Snyder did not exist under prior governor's and prior versions of the EM law because they did not treat minority communities as something to be occupied. Then again, neither Blanchard, Engler or Granholm ever referred to minorities as "those people" like Rick Sndyer has in several interviews and prior governors never called Michigan residents "customers" like Snyder does with great derision---prior governors recognized Michigan residents are "citizens" who have rights and dignities that Snyder denies anyone who is not wealthy and white. The ultimate insult, Snyder eliminated the state tax no his own business which created the budget hole which led to a lot of bad policy from retiree taxes, to cheaper bad water in Flint and now Snyder has decided that he has the authority to unilaterally award a $800,000 contract from the tax payers to his own personal criminal defense counsel. Funny, but so many of the residents of this state(a majority) knew the EM law would not work and was not good; but our "Republican Fathers" knew better than "the people"! They still insist they know more than the majority of the electorate! How can this be? We must make this law go away! We need to clean house from the top down and replace the EM law. The current governor and legislative leadership are arrogant, mean spirited and narrow minded. People suffer and some die when government officials make decisions based primarily on financial considerations and not what is best for the people they are suppose to be serving. A $1.4B tax shift from business to the taxpaying public, the Flint water catastrophe, two years to get an inadequate highway package passed and an educational debacle in Detroit they won't solve and more, sounds like an incompetent group running the show. Seems like the Board of Directors (the electorate) has work to do. Important to realize that most Michigan cities are facing troubles providing key services they need to offer to attract young talent because of state policies that have dramatically cut local revenues. Michigan is the only state in the nation where from 2002-12 local revenues DECREASED. By 8 percent. Next lowest increase was a 25 percent increase in Ohio. We wouldn't need emergency managers if we hadn't crushed them. Michigan was the only state to lose population between the 2000 census and 2010 census. Property values decreased in my township (within Wayne County) by almost 25 percent, resulting in a dramatic loss in revenue but we still managed to pay the bills. Remember, Flint was once a very prosperous city, as was Detroit. In both cases, locally elected officials, through a combination of incompetence and corruption, failed to adequately manage their cities' finances, leaving the rest of the state's residents to 'pick up the tab.' How much longer will the remainder of Michigan's taxpayers be willing to fund failures such as Flint, Detroit, Detroit Public Schools, etc. Unlike the federal government, Michigan cannot just print money - every dollar sent to bail out one community comes at the expense of another community, family or individual. Elect your officials wisely. Emergency manager laws are not needed AT ALL ANYWHERE. They have arisen because of the global economic crisis created by corporate greed and warmongering, led by the United States. All EM laws do is blame the municipalities and school districts which are constantly being cut off from their own tax dollars so they can be spent: 1) On the national war budget. 2) On the debt to the banks of the U.S., its states and its municipalities and school districts. PEOPLE NOT PROFIT! Exactly. Each of these crises has been manufactured by tax cuts and the state and federal misappropriation of public money. Yes, Detroit and Flint have additional tax base and services problems that have been accumulating for a half century, but the nail in the coffin so to speak had been the fact that the state's rural voters have decided to abandon the two cities to satisfy their own warped sense of fairness. The "Why should I pay for their problems?" mantra fails in the face of the interconnected reality of today's complex global economy. This report and the task force report are both badly flawed. The task force said that "the emergency managers appointed by Snyder failed to consider, much less serve, the health interests of residents". That assumes that the emergency managers had knowledge of the lead contamination and the possibility that Flint river water was connected to the outbreak of Legionnaire's disease. That was not the case. That all became clear in hindsight. The task force also recommended that "Such managers also should be given greater access to experts in areas like public health, and should ensure that local residents and officials have a voice in how policy is shaped, including the ability to appeal emergency manager decisions, the task force recommended." But emergency managers thought they had access to experts in public health in the form of the department of health and MDEQ, whose expertise they relied on. And it was "local residents and officials" who were responsible for their cities falling into a financial emergency. Mr. Wilkinson's subheading "EM laws that work" implies that Michigan's Emergency Manager law does not work. Nowhere does he note that there aren't any Michigan municipalities currently under emergency management. True, some cities had several emergency managers before they learned to function with the resources they had available, but they managed to do so. And the task force was not correct when it "derided his insistence that the Flint debacle was a local, state and federal failure of government." It was undeniably a failure on the part of all three levels of government. I have seen no evidence that Governor Snyder ever denied that primary responsibility for this tragedy lay with MDEQ. Mr. Kolb speculates, without any justification, that "Perhaps, someone would have asked about corrosion control, the absence of which allowed lead to leach from the inside of city pipes and into the water entering residents’ homes." How likely is it that anyone in Flint would have known about corrosion control? And it is absolutely true that "Emergency managers alone decided to use the Flint River for drinking water, and stay with that decision even after mounting complaints by residents." Residents complained about bad tasting, discolored and bad smelling water. Is there any logical connection between those characteristics and lead contamination and legionnaires disease? What if there hadn't been any lead contamination and Legionnaires bacteria, and the water switch had saved Flint enough money to hire significant numbers of policemen who might have prevented several homicides? What then? I am disappointed in both Mr. Wilkinson's report and that of the task force. See Marc Edwards' many interviews in the media and Virginia Tech's flintwaterstudy.org. They point out that the corrosion control option should have been understood by anyone claiming to be a water systems expert. Yeah I suppose you can argue that the MDEQ should have informed the EM and that's where the breakdown occurred in the beginning, but that doesn't explain the ridiculous length of time it took for anyone to take action on the issue. That doesn't explain why nobody got a second opinion when the MDEQ started disparaging doctors and scientists that disagreed with their findings. An emergency manager law permitting more local input and decision making may have helped in Flint's case. But the fundamental flaw in emergency manager legislation is that such laws assume the emergency has been caused by local mismanagement, incompetence, lack of financial sophistication or outright crookedness. (And often a subrosa assumption that is quite racist: "those folks" just don't know how to manage their taxpayers' money.") The solution proposed by e.m. laws was to insert someone who does know how to manage money. But the truth of the matter is evident today in both Detroit and Flint. If a city is depopulated there just isn't enough tax base remaining to provide services to those who stay. Emergency Managers are not miracle workers. If the problem is poor management, they might be able to fix that. But it takes money to run a City and an Emergency Manager can't just print money. The ideology of some politicians that cutting costs and lowering taxes will cure all evils, simply will not suffice to make a depopulating city a thriving, livable place. The way we will fix places like Flint and Detroit? Well the whole State and all its taxpayers will have to pay for it, because Flint and Detroit simply don't have the means to do it. And that's just what is happening now with the water crisis and DPS. As a result the Emergency Manager law really needs to provide for a Statewide Taxpayer's Advocate, someone who will help guide additional State resources to the right institutions in a City so that it can begin to repair itself and recover and in the meantime oversee the execution of the changes to see that Statewide taxpayers are getting good results for their money. Local elected officials need to be assisted to develop a recovery plan and state financial assistance to do that planning, and implement the plan, guided by an Advocate. Its an old story: don't provide them with someone who can cut the fishes into smaller and smaller pieces -- give them someone who can provide fishing tackle and help guide them to good fishing holes. Getting rid of the emergency managers makes a ton of sense if any and all ties of responsibility are cut off with the state and local governments can't end up sticking their bills with the state taxpayers. The discipline brought by scared bond markets, unpaid creditors and destitute pensioners is more than sufficient and keeps the state out of potential trouble. Unfortunately our current system leaves the state taxpayers with the bill, the problem community pointing their finger at everyone else and little incentive to change or fix the problem. 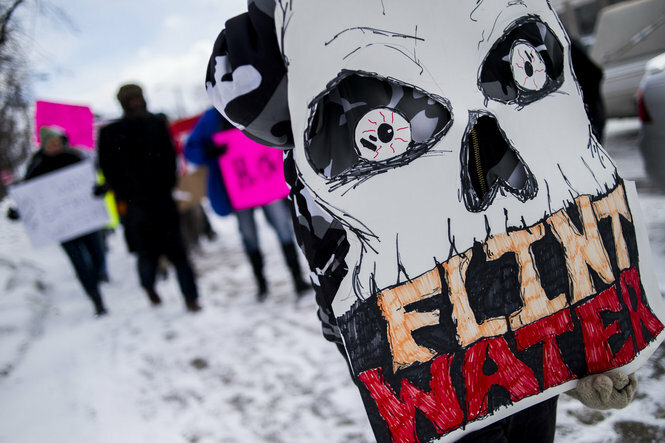 It was not local residents and officials who were responsible for Flint's fiscal problems. First, Flint had the second lowest taxable value per capita of any city in Michigan, about $7,800 compared with a state average of $32,000. Second, Flint's taxable value fell 41% from 2008-2012 and is continuing to fall. And it is just not only Flint. Due to the national housing collapse, taxable value (TV) fell by 20% or more in 69 Michigan cities. Taxable value in most of the cities that lost TV will never return to the 2008 level adjusted for inflation. In Flint's case if TV increased 1.5% a year it would take nearly 40 years for TV to return to the 2008 level not adjusted for inflation. This is because Proposal A of 1994 imposed a cap on TV of the rate of inflation or 5% whichever is less. The TV cap for 2016 is 0.3%. Third, the state has sharply cut revenue sharing payments to local governments. Cities, villages, and townships are receiving $585 million less than they would have if revenue sharing were fully funded. Flint has lost about $60 million over the last decade. From 2002 to 2012, state support to locals increased by an average of 48% in 45 states. In Michigan state support declined by 57%. The next largest decline was 14% in Kansas. Flint's problems were largely caused by the restructuring of the auto industry. The market share of the Big Three declined from 75% in the mid-1990s to 45% today. Our cities are caught in a vicious cycle once the economy falters. Raise taxes and people and business move out. If tax rates are kept low the lack of services will encourage residents and businesses to move out. According to a recent MSU report, Michigan has among the strictest limits on local government’s revenue raising ability of any state. Given these restrictions and our form of government organization (many states have county or metro governments), without a strong revenue sharing program many of our cities are doomed to failure. For a group of politicians who state they believe the people should decide, our Republican lawmakers sure spend a lot of time reversing what the people had voted for i.e. the Rescinding of the Emergency Manager law among many others. But then the Republicans have always believed they knew better than anyone else.